WHEN WILL OUR GOVERNMENT INTRODUCE A TEN YEAR PASSPORT. I HEARD SOME TIME AGO THAT THIS WAS IN THE WORKS. ABOUT 60 % OF PASSPORTS USE LESS THAT 30 % OF ITS PAGES. They have, look on the passport canada website! I totally agree. The passport should be extended for 10 years. Would make life so much easier! 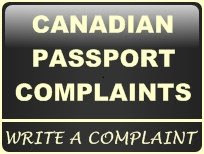 I trust that we Canadians require a Passport from all travelers coming from the US of A and other countries. Scratch my back and I'll scratch yours. What is good for the gander is also good for the goose. in constant jeopardy of safety. Be a happy proud Canadian! Easier is not usually better! Renewing a passport every 5 years is a simple task. Be happy your a Canadian and that you can even get a passport! Of course it cost a little more money but for convenience it is worth it. Why make it so difficult to get a new passport when your old one has expired 15 years ago? Why not ask for new photos, the old passport and documented changes. Saves a lot of time and it is convenient for the applicant, who then does not have to find a guarantor.